size size (required)Small 13-16" / 33-40cmMedium 15-18" / 38-45cmLarge 17-20" / 43-50cmX-Large 19-22" size (required)Small 13-16" / 33-40cmMedium 15-18" / 38-45cmLarge 17-20" / 43-50cmX-Large 19-22" size (required)Small 13-16" / 33-40cmMedium 15-18" / 38-45cmLarge 17-20" / 43-50cmX-Large 19-22" size (required)Small 13-16" / 33-40cmMedium 15-18" / 38-45cmLarge 17-20" / 43-50cmX-Large 19-22"
'Finnstown' is a chic martingale collar. 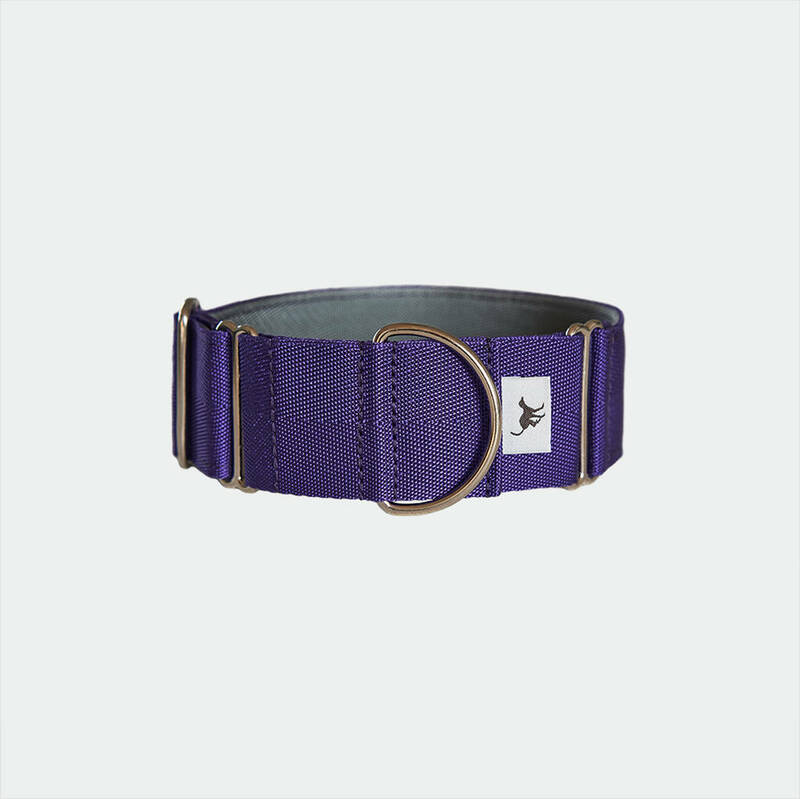 The hound's choice of designer collars, in a stylish V-Twill webbing and hand-crafted by Brindle & Whyte. 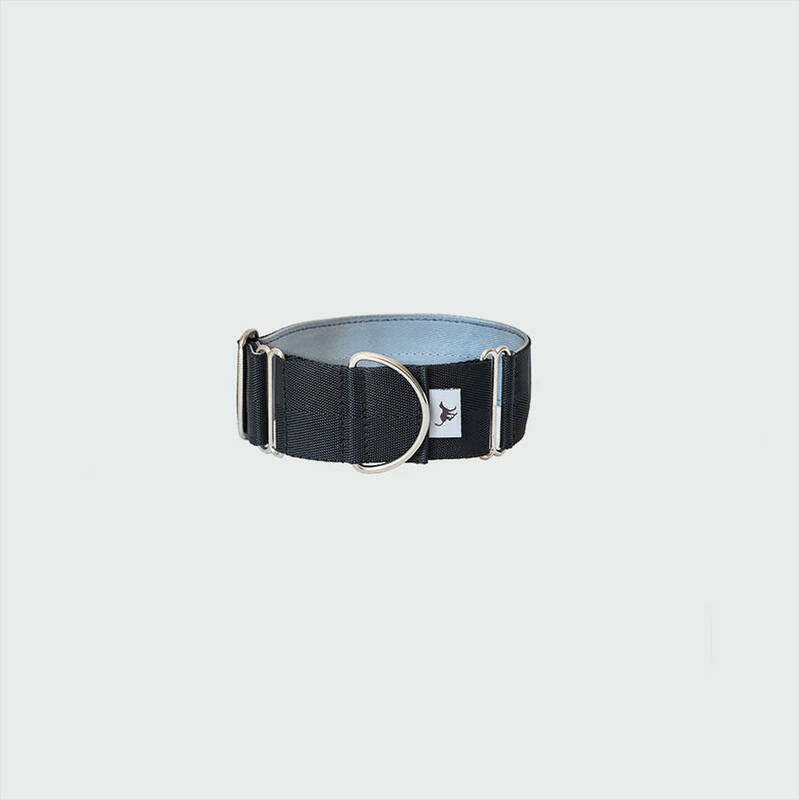 A very wide, strong collar - Finnstown is designed to sit flat on your hounds neck. 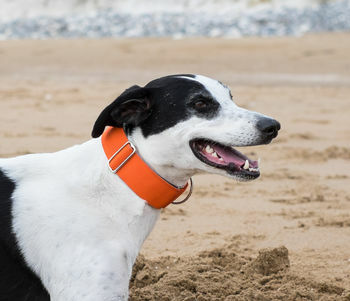 A martingale collar is particularly effective for any breed that is prone to slipping or backing out of their collar. 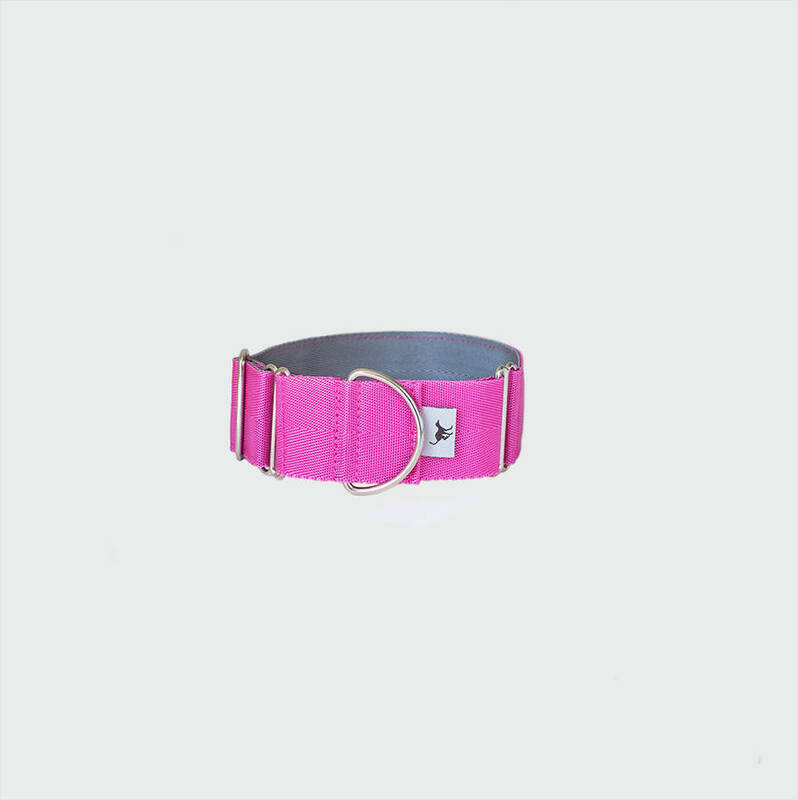 They are also extremely useful for breeds with thick fur around the neck which hinders the secure fastening of buckle collars. 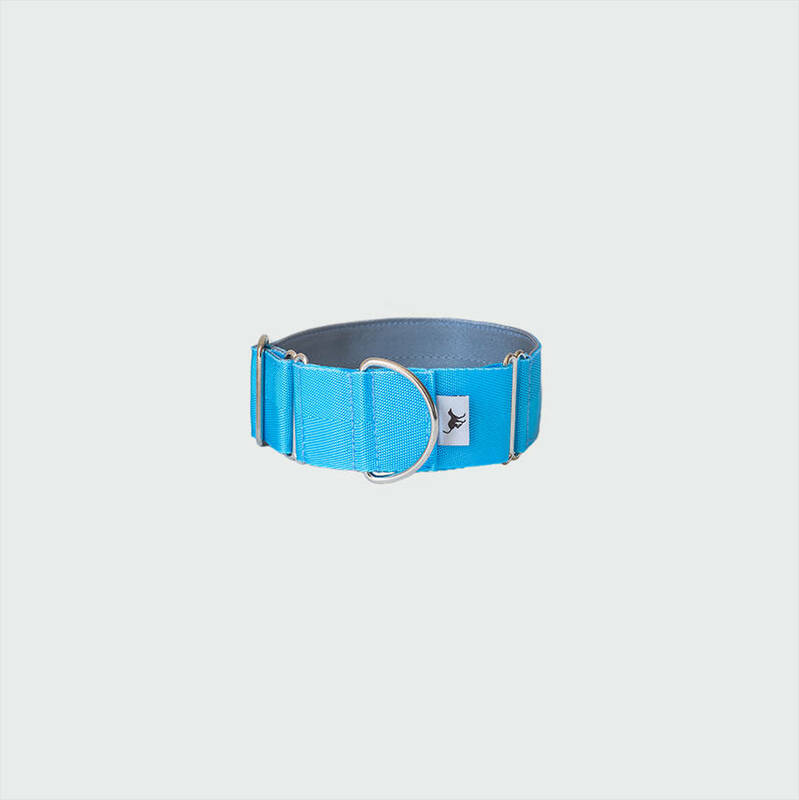 Unlike traditional collars that have to be buckled uncomfortably tight to prevent escape, a martingale collar is adjusted to a comfortable tightness, so it never chokes, but contracts snugly to prevent escape when needed. 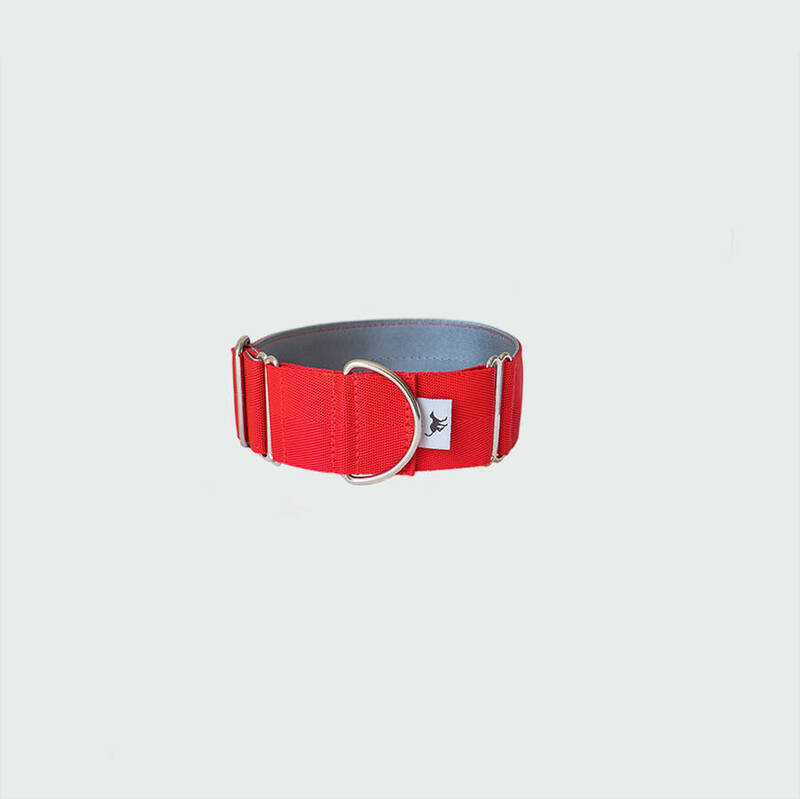 Designed for hounds, manufactured for living. Matching lead will be a plain weave two-tone lead, 110cm long, with the main colour on the outside and silver on the inside. A double layer of polypropylene webbing, nickel plated hardware. Easy to clean and UV resistant. Guaranteed not to shrink, washing mashine safe and can therefore always be brought back to life. Lead is 19mm or 25 mm and 110cm long. 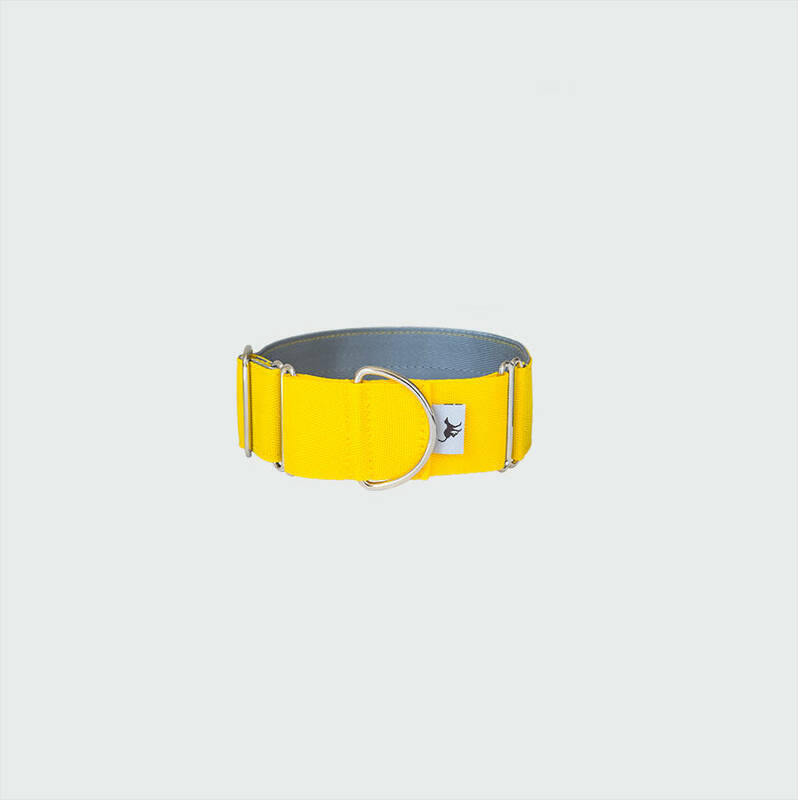 Our colour-matched leads are 19mm or 25mm wide, plain-weave and comes in 110cm length. 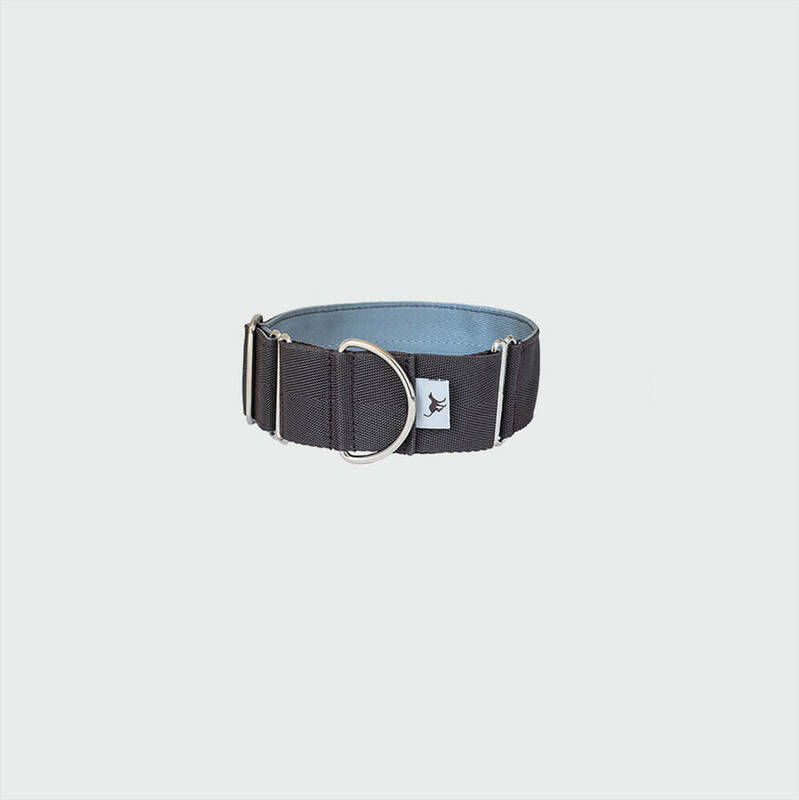 Sizes: Small 33-40cm / 13-16", Medium: 38-45cm / 15-18", Large: 43-50cm / 17-20"
How to measure for correct size: Either use an existing buckle collar or form a loop from string or tape. 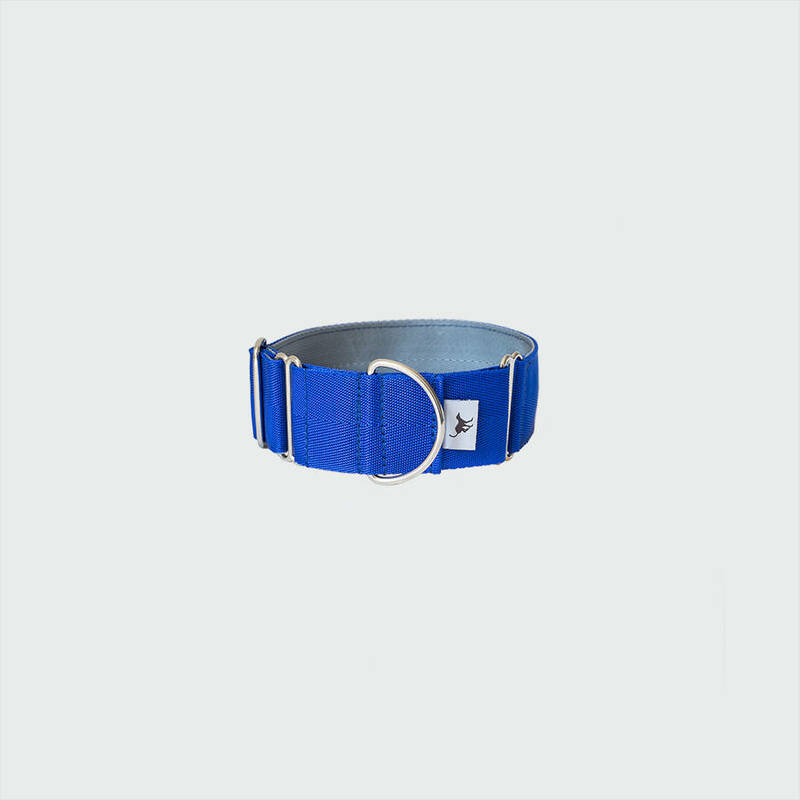 Adjust it to find the size that slides comfortably over your hound’s head. 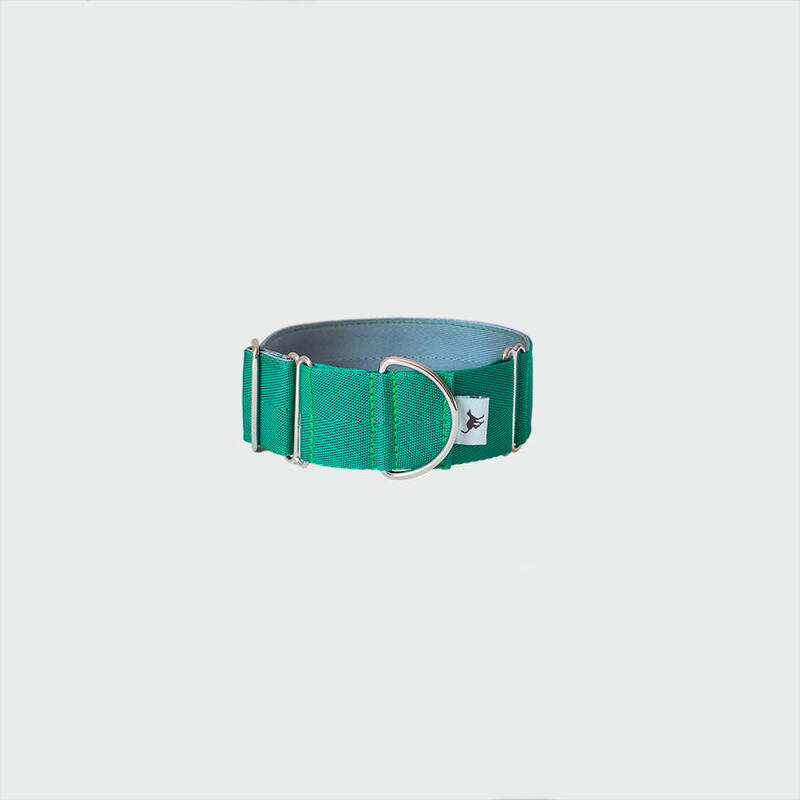 Once on, check that it will slide off without hurting your hound’s ears. Now measure your hound's neck at a mid point on the neck, or where you wish the collar to sit when in use. When you have these two measurements, compare them to the sizes in our size chart. The correct size is the one which covers both these measurements. This product is dispatched to you by Brindle & Whyte.